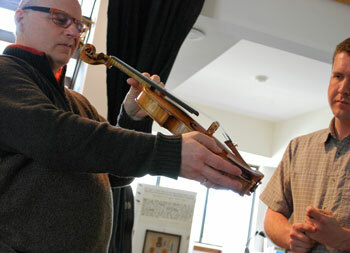 Last year a local Ann Arbor attorney, Zachary V. Moen, apprenticed himself to Ann Arbor master violin maker Gregg Alf. And now, under Alf’s direction, Moen has completed two violins. On Monday afternoon at Alf’s Prospect Street studio in Ann Arbor’s Burns Park, Moen and Alf allowed The Chronicle to bear witness to the first sound check of Moen’s second violin. It’s a copy of a famous instrument made by Joseph Guarnerius del Gesù (1698-1744), and played by Norwegian violinist Ole Bornemann Bull (1810-1880) – the Ole Bull del Gesù. 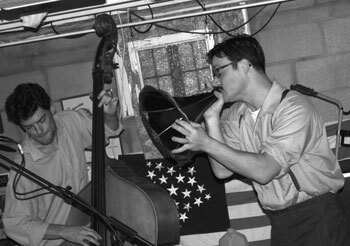 An Orpheum Bell rehearsal: On bass, Serge van der Voo; vocals sung through a gramophone horn, Aaron Klein. I’m wedged in the corner of a west side Ann Arbor basement amongst a jumble of musical instrument cases. The cases belong to the six musicians of Orpheum Bell. 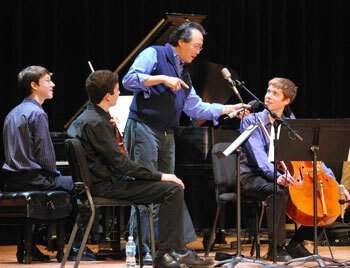 There’s more than one case per musician – they each play an array of different instruments. During a break in the rehearsal, I have to ask: What is that? 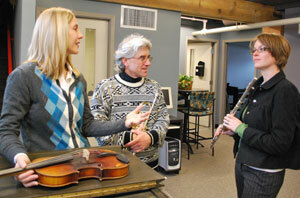 It’s a Stroh violin, “spelled like the beer,” explains Annie Crawford. 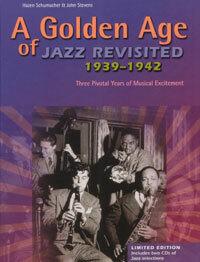 Serge van der Voo had sent along a review copy of the CD to The Chronicle. In a world of MP3 files flung around the Internet, a physical CD is an awfully clunky way to deliver musical data. But when I unfolded the heavy card stock CD cover into its 16-inch total length, I noticed one of the folds was not exactly uniform and regular – not the way you’d expect if a machine had produced several thousand of them. 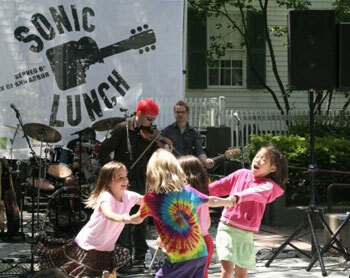 A group of girls dance to the music of Enter the Haggis at Thursday's Sonic Lunch, a free weekly concert series in Liberty Plaza. Balloons, bubbles and the sound of bagpipes filled Liberty Plaza in downtown Ann Arbor last Thursday, as the Celtic rock band Enter the Haggis drew a crowd of people with soup and sandwiches in tow for the season’s first Sonic Lunch, a free, weekly outdoor concert series. Oftentimes here at The Chronicle we cover wildly different events within the span of a few hours. And equally often, it ends up that seemingly different things – like classical music and a language competition – have all sorts of connections we never imagined. 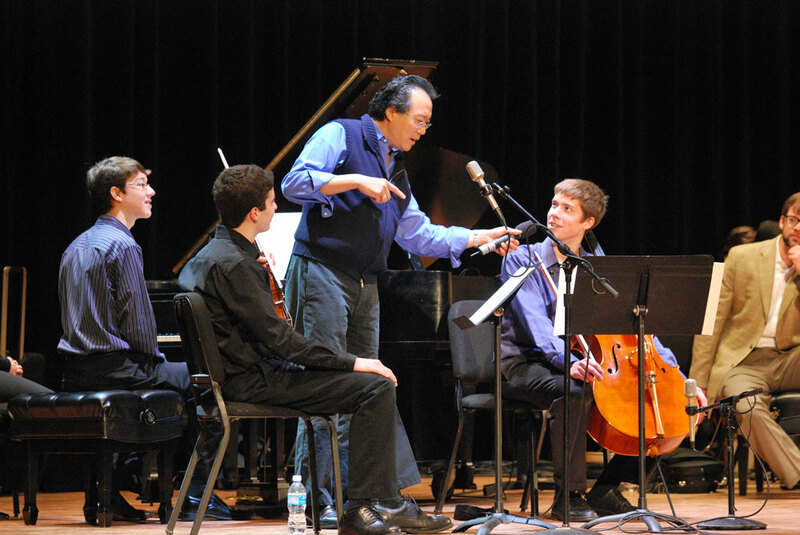 And so it was on Saturday, when we observed first a master class taught by cellist Yo-Yo Ma and the Silk Road Ensemble at Hill Auditorium, followed by a statewide Japanese Quiz Bowl at the University of Michigan Modern Languages Building, just behind Hill. Both events were attended by several hundred people, and both had communication at their core. At the Ann Arbor School for the Performing Arts, Stephanie Weaver, Ken Kozora and Angela Martin-Barcelona with instruments donated to the Horns for the Holidays program. 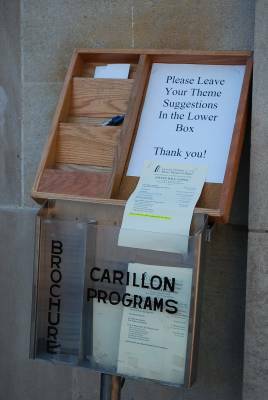 Programs for the 7 Mondays at 7 carillon concert. A beautiful end-of-summer evening, a holiday weekend, a free outdoor concert by a world-class musician – it all came together on Labor Day for the final 7 Mondays at 7 carillon recital at UM’s Burton Tower. Several dozen people showed up to hear Steven Ball play songs ranging from Ravel’s La Vallee des Cloches to a Wizard of Oz medley, as children played in the Ingalls Mall fountain and students strolled by. Like many of the folks sitting in folding chairs or on blankets around Ingalls Mall, David and Marilyn Cummins brought a picnic dinner to eat before the show. They said they came to the concert just to get out of the house and do something. “Then we’ll know we’ve had a holiday,” Marilyn laughed. “And the price is right,” David added. At 10:25 a.m., Elbel Field was mostly empty except for a few Labor Day picnickers and some guys playing on the beach volleyball court. But exactly at 10:30, a stream of students carrying every manner of instrument started streaming out of Revelli Hall, crossing Hoover Street and meandering up the sidewalk toward Elbel. 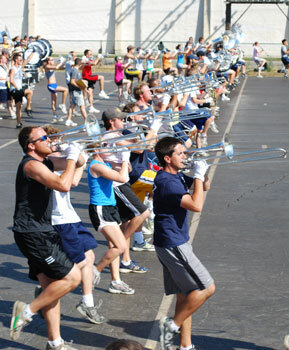 The band's trombone section works on their formation during a Labor Day rehearsal at Elbel Field.